Some say wine is good for the soul, a sentiment appreciated at St. Joseph Catholic Church on Old Mission Peninsula. An interesting story on a lesser known wine from Old Mission Peninsula! (GRAND RAPIDS, Mich) — For the past 10 years, Michigan wineries have played an integral role in the Grand Rapids International Wine, Beer & Food Festival. This year, the newly-formed Traverse Wine Coast—featuring wineries from both Leelanau and Old Mission Peninsulas—are making their presence known in a big way, November 16-18 at DeVos Place in downtown Grand Rapids. The Traverse Wine Coast is home to two of Michigan’s five American Viticulture Areas (AVAs), situated within northwest Michigan’s premier grape-growing region (one being the Leelanau Peninsula and the other the Old Mission Peninsula). Thirty-five wineries are located within diverse microclimates uniquely suited for a variety of wine grapes; 20 of those wineries will be in Grand Rapids for this year’s Festival (see list below) on display in the south end of The Vineyard (Steelcase Ballroom). On our latest episode, we discuss tips for visiting wineries on Old Mission Peninsula, what we've/you've been drinking, upcoming events and more. You can listen in by clicking here. October 9, 2017 (Traverse City, MI) - Wineries of Northwest Michigan, the state’s premier grape growing region, have strategically combined forces for a new initiative to create a brand that best showcases the high quality wines being grown in the area. In partnership with TC Tourism, Traverse Wine Coast launched its first Traverse City Uncorked event which showcased myriad events across the region during the month of May, which is Michigan Wine Month. The event was a huge success in its inaugural year and will take place again in May of 2018. Grand Traverse Resort and Spa is partnering with the Wineries of Old Mission Peninsula (WOMP) during Michigan Wine Month to present a WOMP Wine Dinner on Saturday, April 9 at the Resort. The non-traditional dinner will take place in the Resort’s Governors’ Hall and will feature eight stations around the room, each with select wines from one of the WOMP wineries paired with a small plate created by one of the Resort’s chefs. Dinner attendees will stroll from station to station for the wine and small plate pairings. Last month I reviewed recent winery additions on Leelanau Peninsula. A few miles away, across the West Bay, lies the equally picturesque Old Mission Peninsula, a narrow, rolling finger of land: 19 miles long and up to four miles wide. Jutting out into the moderating waters of Grand Traverse Bay, the marine influence, glacial soils and rolling hills make this one of the grape-friendliest places in the state. Michael Brenton hits up Old Mission Peninsula for Lansing City Pulse. What's your favorite OMP winery? In an informal sense, Traverse City has long been the "city of riesling." Nearly every northern Michigan winery includes at least one riesling in its repertoire, and interpretations of the great grape have netted the state increasing domestic and international acclaim. 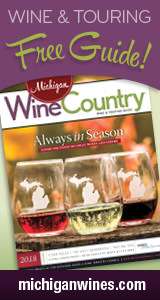 Cort previews the upcoming City of Riesling event in TC in one of her latest Michigan wine blogs for HourDetroit.com. Old Mission Peninsula and Leelanau Peninsula wineries are teaming up with several Northern Michigan businesses for a new passport program that offers up a trifecta of bonuses for wine lovers. Launched July 1, the Old Mission/Leelanau Winery Passport offers bearers discounts and perks at participating wineries on both peninsulas, including complimentary tastings and percentages off wine and merchandise purchases.